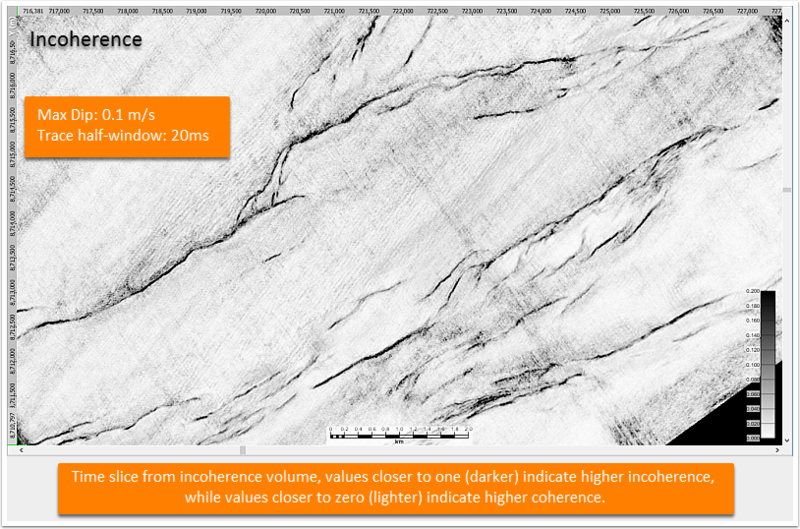 Insight provides several tools for elucidating faults, fractures, and stratigraphic changes. These processes measure trace discontinuity and reflector curvature in seismic data sets. By applying these processes to a volume, attributes can be generated for curvature, incoherence, semblance, correlation, and directional correlation. Displaying discontinuity and curvature on time slices can reveal faults and fractures that aren't apparent when viewing seismic. Interconnectivity of closely-spaced fracture networks can be resolved, allowing for interpretations to be made regarding reservoir quality or hydrocarbon migration. Elements of depositional systems can also be visualized providing valuable information towards determining reservoir boundaries. The Incoherence and Correlation process use a correlation algorithm and respond to changes in the waveform, but are not sensitive to amplitude. At each sample, a measure of vector distance is calculated independently to neighbouring traces, based on user-specified inputs for maximum dip and vertical window distance. 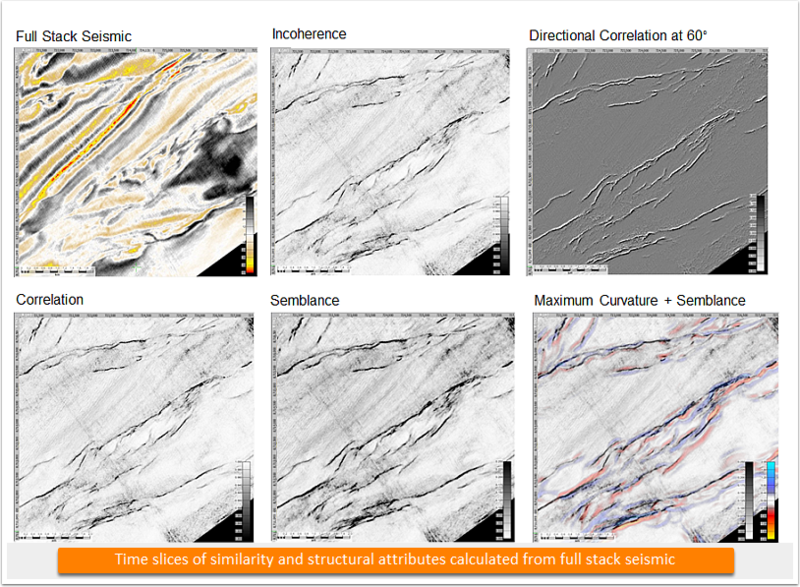 Calculations for these attributes are fast, but can miss subtle structural changes due to close fracture spacing, and low-offset faults or stratigraphic changes caused by lithology variation. Semblance operates over a larger spatial window and is sensitive to both the amplitude and the waveform. It can identify subtle features that are missed by correlation based measurements. Because semblance is sensitive to amplitude, this attribute can be especially useful for displaying depositional features. Directional correlation analyses a moving spatial window, while applying a directional bias. The directional bias allows it to accurately identify features with a particular orientation, bypassing the impact of structural features perpendicular to the specified direction. 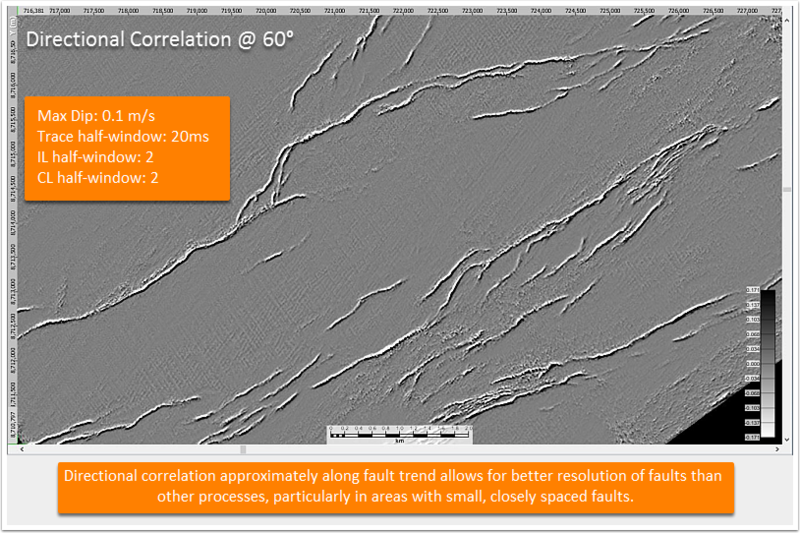 It is a useful tool for identifying boundaries of channel features in areas with significant faulting. Image A) 80° directional correlation, roughly along structural trend. 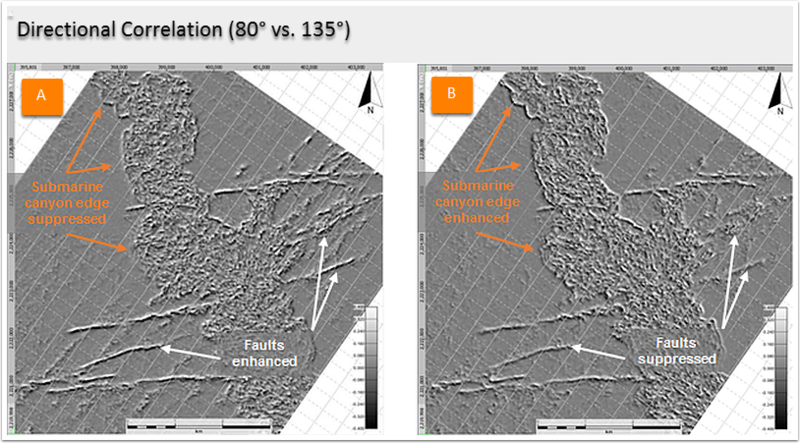 Submarine canyon edge is suppressed (orange arrows), faults are enhanced (white arrows). This allows for more precise mapping of faults in areas where stratigraphic elements cut through structure. Curvature responds to changes in structure or the change in dip. 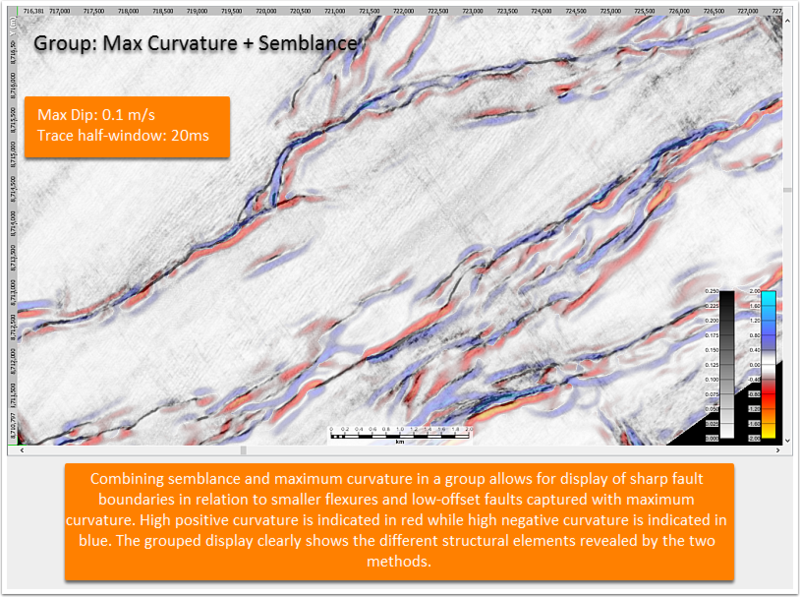 In cases where traces are coherent, such as in areas which have slight flexures associated with fractures or low-offset faults, curvature can highlight changes that are missed by other similarity-based measurements. Stratigraphic elements that curvature shows well include channel levees and bars, along with diagenetic features such as karst. Find out more about Curvature. Chopra, Satinder 2009 - Interpreting fractures through 3D seismic discontinuity attributes and their visualization, CSEG Recorder, October 2002, 5-14. Chopra, S. and Marfurt, K.J., 2007 - Seismic Attributes for Prospect Identification and Reservoir Characterization, EAGE, Geophysical Development, 11, 45-98. Marfurt et al. 1998 - 3D seismic attributes using a semblance-based coherency algorithm, Geophysics, 1998, 1150-1165. Next: Horizon Tools - Take your pick!